"Addictive" was once high-praise paid to an absorbing game, but over the last several years it has become much more conflicted. This shift reflects a change in the way games are designed, purchased, and played. The meaning of "addictive" is colored by the growing suspicion that game addiction is no longer a figure of speech, or the byproduct of good game design, but the point of the entire enterprise. This suspicion was a focal point of the Game Developers Conference this past March, an event that Soren Johnson described, without too much irony, as "Fear and Loathing in FarmVille." Confronted by Zynga's success with FarmVille, game designers and intellectuals debated the ramifications of a videogame culture that is increasingly driven by rewards, and whose most lucrative products mine the time and attention of ever-increasing numbers of players. The central question for many game developers is not "How can we?" but rather, "Should we?" Jonathan Blow sounded an early warning in a 2007 "Design Reboot" talk. "My concern is that the game designers of today lack discernment when we're thinking about whether our game is good or bad," he said. "The way we evaluate a design, usually, is by looking at whether or not a lot of people want to play our game. If they play it and they report that they're having fun, we're like, 'Hey, that's a good game.' ... As designers, we don't tend to care why people want to play our game ... And I'm going to claim that means that we don't show concern for our players' quality of life." With more publishers adopting subscription and free-to-play (F2P) business models (where players can access most or all of a game's content for free, but must pay for convenience items or special content), "hooking" players on a game grows more important. It also introduces a raft of ethical complications that retail game designers did not have to address. "Games with a tangible finish line have an easier time being 'ethical' because the addiction can only ever be temporary," Soren Johnson explains. 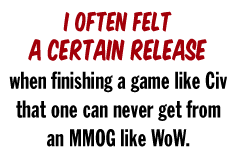 "In fact, I often felt a certain release when finishing a game like Civ that one can never get from an MMOG like WoW. Persistent games will always have a problem with people who just get sucked in with no hope of release." As the industry has grown more enamored of F2P and the power of a game like World of Warcraft to produce seemingly endless revenues, fewer games have clear finish lines, and more of them employ addictive mechanics. These mechanics can muddy the issue of whether or not players are actually enjoying themselves. "Generally speaking, any sort of unlock is a very addictive mechanic," Johnson says. "In Civ, this comes across as 'just one more turn' to discover gunpowder or finish the Pyramids or whatnot. Many games have taken this dynamic and moved it to the meta-game - a racing game where you unlock cars over a series of races, for example. It's an open question whether this system is making games better or just making people feel like they need to play more. Can we tell the difference between people playing more because they are enjoying themselves or playing more because they feel compelled to?"